A week ago I was leaving Columbus, OH after having a fabulous time at The National Needlearts Association‘s Summer Session. The reasons for being there were work-related, but that did not mean I could not enjoy myself either. Many folks have asked me about what exactly happens at TNNA and what goes into all of the fanfare and events. Here is my personal frank explanation (whatever I write for my site is not always in the same opinion as those whom I work for) and I do hope those who read this post see TNNA with new eyes. One of TNNA’s purposes is for wholesalers to show their newest and latest products along with introducing new companies to retailers. This summer session was no different for me since my work was often done inside and outside the booth. 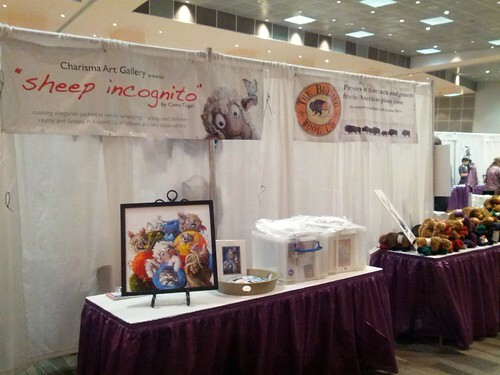 Not only was I marketing the Buffalo Wool Company‘s new yarn lines and yarn selection system, but I was also introducing Conni Togel’s Sheep Incognito artwork to the local shops and needlearts industry companies. I participated in several off-site business meetings that may seem like playtime, but were full of things not always easy to communicate over the phone and email. Most of the time, impromptu meetings occurred when I had run into folks and due to the nature of a key topic that we have been facing, we began discussing possible resolutions or fixes. Those types of meetings are where I think “newbies” to TNNA (though seasoned veterans do it too) have a tendency to cut in without any sort of apology for intruding to introduce themselves to the person I am talking to. One dyer who was here for her first TNNA and whom I know quite well did that while Casey and I were heavily discussing ways to make Ravelry editing smoother for one of my employers, Westminister Fibers Yarns. She ended up leaving after standing there in our conversational pause as we waited for her to leave. Throughout the TNNA summer session, classes are given to help those interested in various teachers and topics. There are many sponsored activities to promote networking for retailers and wholesalers such as luncheons, representative meet ups, group meetings and vendor connections. People on the whole are social creatures, and as such we tend to network best when an amicable setting is there for us to sit down and chat. For a certain number of designers, manufacturers, and publishers, the Hyatt’s second floor lobby area is perfect during the afternoon until late night. I have made many friends while hanging out and knitting in that circle; many of them are like me in combining work and play. If you are working a booth and do not have prior arrangements on a schedule, show up on time before the event starts. Better yet, show up earlier in case the person running the booth needs help. While working in the booth, remember that you are there to help in promoting the booth owner, not yourself. If another vendor (wearing a red-inked badge) comes up to visit, and a yarn shop retailer (wearing a blue-inked badge) appears, immediately greet the retailer. If the other vendor is a seasoned TNNA veteran, s/he will understand if you do not continue your conversation until later. When you see folks chatting, assume there is business being discussed. It does not matter if they are in the middle of an aisle, at the hotel bar, in a showroom booth, sitting in the cafeteria area, or even standing in a hotel lobby. Many folks hold meetings during TNNA. If you must interrupt a meeting (like I had to in giving Melissa Leapman’s business card to Mary Catherine Black of Premier Yarns) silently walk up, apologize, slip the card quickly on the table in front of the person it is for, and walk away. If you are a new designer who is attending TNNA to get free yarn for your stash, beware that your name will most likely be shared with other manufacturers. I will not share the newbie person’s name who bragged to a group of smokers that she came to TNNA to get as much free yarn as she could, but I found the whole situation crass and ballsy. Speaking from the manufacturing point of view, if I give a designer some yarn under the knowledge that something will be designed for whomever I work for, and that person does not do anything with it, that is not cool. If you want to promote yourself, be prepared for the unexpected. The talented EJ Slayton (aka joy-knits on Ravelry) has designed for many companies through the years. I had knitted a “swatch” from one of her sweater designs into a 7″x9″ square and it turns out she fondly spoke of how she was tickled someone noticed that sweater. When I admitted it was little ol’ me, hugs ensued. 🙂 But one thing that she and Diane Zangl did was put their portfolio into a way that folks can see their designs at any time. EJ has her iPad; Diane uses a Kindle Fire. Both were able to show their designs to a well-known manufacturer who then wanted their information. You never know who you will meet around the corner and will want your work. Those tips are rather helpful for any trade show. I think that oftentimes people can confuse “Trade Show” with “Consumer Show.” Both shows have completely different purposes. 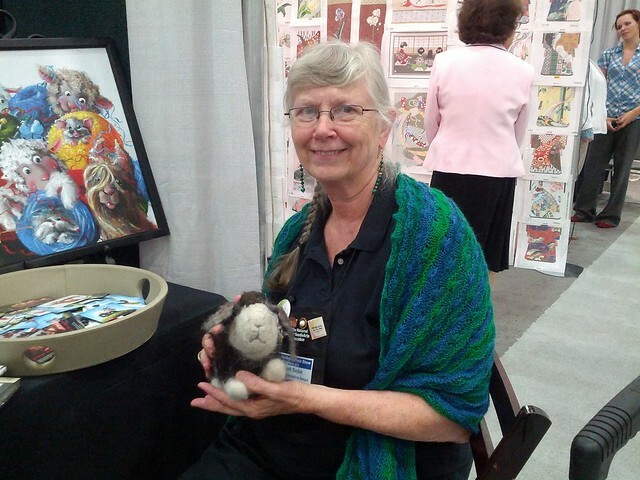 TNNA is NOT Comic Con for knitters. Thank you for the compliment. I love your idea of the canvas! Maybe I’ll knit myself a little rectangle to embroider those words on it. Thanks, that was a great intro to TNNA. As a new designer, I’m hoping to join TNNA soon and start attending the conferences. Maybe I’ll run into you there! I appreciate your understanding. A fair amount of us attend TNNA to work, even though we still have fun while there. See you in a future session! I’ve worked many trade shows both as a buyer and seller. I love your comments. You have sparked an idea for my new business and I thank you. I am going to put my samples on my ipad (new) . I’ve been of the old school where you carry them around to show. Thank you, thank you. EJ had a rolling suitcase in which she kept her hard pattern copies. She discovered that it was easier opening the iPad and flipping through the inages. So next year she may do away with the hard copies in which there will be less stuff to lug around. Yes! Thank you! I think the biggest issue is when shop owners are bringing their employees or friends with them to TNNA. These guests have no real stake in the process and cannot grasp that it’s not a freebie fair or meet and greet. Good for you for putting this out there Kim! These are some great points, Kimberly! Thank you for posting this article. Benjamin, it was my pleasure. Thank you for the compliment. I had wanted to write a similar post due to what I learned from working at XRX for both TNNA and STITCHES. After seeing the frustration many folks were experiencing with the new attendees this year, I thought it best to write the post. Nice to see you at the Hyatt! Thanks Michele. I enjoyed meeting you too. Too cool that we are both friends with Jessica, eh? If you ever are visiting her in Richmond, you guys need to come over for food, drink and yarn tasting! OMG! I remember talking to you after one of our social media panels. Sorry that my brain did not remember right away!